If you have thought that trading based on the accurately calculated position size cannot get any better, think again. Now you can use a MetaTrader script to place orders based on the calculations of the Position Size Calculator indicator. The script will detect the position size calculated by the indicator and will place a trade accordingly, whether it is an instant order or a pending one. For pending orders, it will also detect whether a stop or limit one should be used. You can download the .mq4 file (or .mq5 if you are using MetaTrader 5) of the script or the same source code in .zip (MT5 in zip). You will have to place it in your MetaTrader’s /MQL4/scripts/ folder (or /MQL5/scripts/ in case of MT5). 4. Done. You can now press the key combination to invoke the script at any time to open your trade immediately. If you have any comments or questions about this trade placing script based on Position Size Calculator output, please post them using the form below. This is a very nice script. Thanks for sharing it. I like to put a comment in my trades. So I am wondering if it is possible to have Order window opened and filled by this script but let me put a comment and then place it myself. Unfortunately, that is not possible. You can only change the comment by editing the script’s source code prior to executing it. Hello Andriy – I cannot get the position size indicator to display the correct levels for entry, stop loss and take profit – even though they are correctly entered into the indicator settings. I have a screen shot which I can email you to show what has gone wrong. Just need to know where to send it to. Just set DeleteLines input parameter to true. It will fix the problem. OK – That has fixed the display but now the lot size has disappeared – so what next ? Could you please show a screenshot? Sorry Andriy – its my fault – it obviously updates the screen when the asset price changes. I was using this when the market was very quiet and very few price changes !! Hi Andriy, good day! I downloaded this script but the diamond in the lower right portion of the program icon is in gray. I have already downloaded the mq4 file and transferred it to MQL4/Scripts. So how do I fix this? Thank you! Can you open it in MQL Editor? If yes, can you compile it there? Are there any errors? I right clicked on PSC-trader and clicked modify. It opened MetaEditor. I clicked on the green play button and I was redirected to MT4. However, a prompt showed stating Position Size Calculator not found. However, i do have the PositionSizeCalculator_separate under indicator. What should I do next? Thank you in advance! 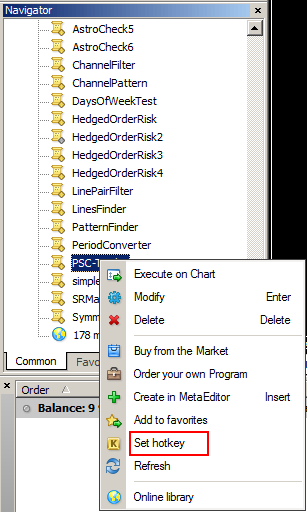 To use PSC-trader, you have to attach PositionSizeCalculator_Separate or PositionSizeCalculator_Main to the chart, then launch PSC-trader script (just double-click it, do not go to ‘Modify’). Thanks for your reply, Andriy. I attached positionsizecalculator_separate to the chart; then added my price parameters. Afterwards, I double clicked on psc-trader script but my pending orders are not showing up under the trade tab. Is this normal? Thanks! Does it say anything in the Experts tab of the Terminal window? Is this a result of my using a demo account? I’m using fxcm mt4. Thank you for the time answering my questions! 1) Did you enable AutoTrading? 2) Does your FXCM MT4 account allow opening pending orders with SL and TP? Some brokers only allow setting SL and TP to existing pending orders, not to open pending orders with SL and TP. 3) Does your FXCM MT4 allows opening orders with size 0.11 (can you open it manually)? 1) I have enabled AutoTrading. I think i’ll just switch to another broker. I was wondering if you could tell which broker have you used your script? Thank you! Then compile (F7) and try to run it again in MT4. Then, please tell me what did it output in the Experts tab. Hopefully, knowing the exact error code I will be able to fix this. Which is different from the line you just posted above (in my PSC-Trader.mq4, it is showing in Line 147). I did your instruction but is still not working. What did it say in the Experts tab this time? I just reinstalled it and it started working! Your script is great!! Thank you for your fast response!! I am glad that it works for you now! How can I save PSC on my MT4 from the start please, I’m using FXCM demo account. What do you mean by “saving PSC”? You can save Position Size Calculator by right-clicking on the download link (on this page) with your mouse and choosing ‘Save Link As’. Then you can unzip the downloaded archive and copy the files to /MQL4/Indicators/ of your platform (you can quickly access that folder by clicking File->Open Data Folder from within the platform). Thanks for sharing your position sizing script & indicator. I have something very confidential to discuss with you hence, can I please have your email for that purpose? Hello andrily i have recently installed your psc on my Mt4 but when i try to double click it to run it it just doesn’t seem to work on mt4. it says position size calculator not found then i installed position size as well on script folder. still now working what have i done wrong. PSC-Trader script will not work if Position Size Calculator indicator is not attached to the chart when you run the script on it. It will output “Position Size Calculator not found!” It means that you have to attach Position Size Calculator indicator to the same chart before running the script. thanks alot for your unconditional support Andriy. i did as you said now its saying stoploss line not found. Did you delete it or rename it? Thanks for such a good indicator. I want the stop loss based on yesterday’s high or yesterday’s low of the daily candle. How do I change this on the indicator? If we are talking about Position Size Calculator, you just move the stop-loss line to the yesterday’s high or low. Or you can type it into stop-loss field in the panel. Hi Andriy, does the script work with a zero account balance? Thanks! That depends on how you set up your Position Size Calculator indicator. If you set some fixed money risk instead of account percentage, then it will calculate a correct position size value. Then, you can use the PSC-Trader script to try opening that position. Now, it all depends on how your broker functions – does it allow opening trades with zero account balance? i have downloaded the script but i dont know why i cant use it. What happens when you try using it? Are you using it together with the Position Size Calculator indicator? Hi. This is a great tool! Thanks for sharing. My question is, regarding short positions. Are you going to include in future updates? It already works fine with short positions. Did you encounter any specific problems with short trades? Hi, amazing indicator and script. Would there be any chance of adding a new option/feature. I always place my stop loss ‘X’ pips above or below a high or low. So say I place the indicator Stop Loss at a high or low, then it adds or subtracts ‘X’ pips before doing the calculation. Hope this makes sense. I am not sure if I understand you correctly, but you can move the SL/TP lines wherever you want when using Position Size Calculator. I wanted the indicator too do calculations and enter the SL ‘X’ amount of pips above or below what the SL placement on the chart is. It’s easier when scalping too see and place the SL at a high or low, then the indicator adds or subtracts ‘X’ pips too the SL depending if it’s a buy or sell order. I have managed too modify the source code I think as you made it open source and it looks like it’s doing the correct calculation. Will test when markets are open . My plan rules dictate the SL to be 3.5 pips above a high for a sell order and 3.5 pips below a low for a buy order. It’s easier and quicker when scalping too place the indicator SL at the high or low, instead off finding and placing the SL 3.5 pips higher or lower than a high or low, then make the indicator and script think the SL is actually 3.5 pips higher or lower. Hope this makes sense. OK, now I understand. It is easier just to code a script, which when triggered would move the lines to X pips above/below the high/low. If you only change the script, then it pulls the wrong position size calculation from the indicator though. I have managed too change both since my original post. I did not mean changing the PSC-Trader script. I meant coding a completely separate script, which would adjust the SL and TP lines. Hi, this is really great thank you! Did you attach the Position Size Calculator indicator to the chart where you try to launch the PSC-Trader script? I want to run the script to place order, but it doesn’t work! PSC-Trader NZDUSD,M15: Execution failed. Error: trade is disabled. I compiled the script and enabled the AutoTrading. I can also manually place the order, but not with the script. Another issue is that Position Sizing Calculator settings reset to the default whenever I open it! I change the settings from the inputs tab (line colour, line style and so on) for position sizing calculator, (even save it) but when I close the calculator and open it again, it reset and I need to either set again or load what I saved before! Why it does not keep the settings I made?! Regarding PSC-Trader: Could you please make a screenshot of the entire platform with Experts tab open when you try to launch PSC-Trader? 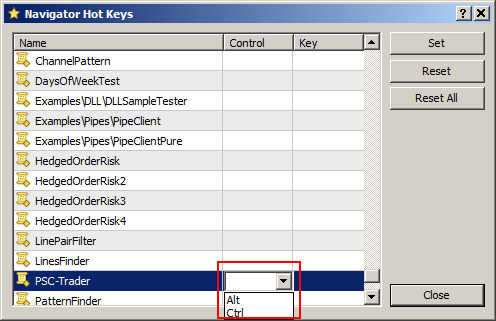 Save settings into a .set file and load them when you attach the indicator again. Do not close the indicator but rather minimize it. Save the indicator with its settings into a chart template and load the chart template when you need it back. Does your broker allow trading with expert advisors? Are you able to open trade with other scripts or EAs? Otherwise, the symbol is closed for trading, but you say that you are able to open the trades manually, so that should not be the case. Most probably, your account type does not allow EA execution. A friend of mine with the same broker use this script without any problem! That could be a difference in the account type or account permissions. Are you able to use other trading scripts or expert advisors in that account? If not, you should contact the broker about the issue. Hello and many thanks for this great, valuable and useful script. I want to know how the default value of Entry, SL and TP will be calculated here? Is it possible to link the SL and TP to the entry price? For instance, whatever Entry price assigned, then SL assigned to be 10 pips (for example) below the entry and TP 15 pips above the entry. In addition, Is it possible to assign the Entry 10 pips (for example) above/below the current price by default? The PSC-Trader is meant to be used only with the Position Size Calculator indicator. SL and TP are set using that indicator. I know the true reason for the position sizing. I just want to know if this is possible or not? 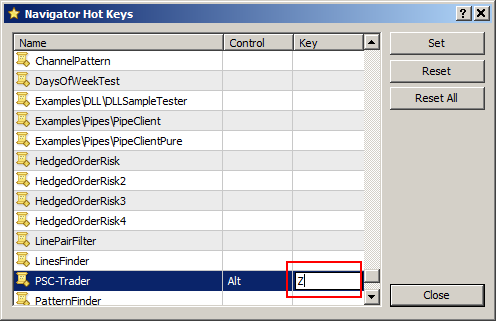 Please kindly let me know how the position sizing assign the default values to the Entry, SL and TP? In addition, is it possible to assign SL and TP based on Pips distance and not Price? The PSC indicator uses the current candle’s Low for SL when you attach it to the chart. If you set UseFixedSLDistance and UseFixedTPDistance to true, you will be able to set both SL and TP in pips vs. price levels. I did change the “UseFixedSLDistance” to true and it works perfect. Now I should enter the SL as fraction pip and not pip. For instance, SL=80 results in SL of 8 pips! Am I right?! In addition, Can I set a default SL to be always, for example, to be 8 Pips rather than set it each time? The pips are set in your broker’s pips. If your broker uses fractional pips, it will be in fractional pips. There is no way to set the default SL. Hi all, thanks Andriy for this valuable tools. I have one question problem and one request. PSC-Trader GBPJPY,M15: Execution failed. Error: trade is disabled. PSC-Trader AUDUSD,M15: Execution failed. Error: trade is disabled. This is the case most of the time, but sometimes it works!!! I don’t understand why sometimes it places the order and sometimes not! I reinstall the MT4 and positionsizing and its script, but still the same! I am wondering if you know why sometimes my trade is disabled or sometimes enable. the position sizing script works perfect when we go long. for the entry, it assigns the high of the current candle. When we go short, it should assign the low of the current candle (current price) to the current price, however, still high of the candle will be assigned again which is not correct! Would you kindly either fix this issue or let me know where in the code you assign the entry price, so I can fix it myself and not be taking your time. “Error: trade is disabled.” is caused by your broker turning off either trading for the current symbol completely or just for scripts/EAs. You need to discuss it with your broker. PSC-Trader script does not work by itself. It works only with the Position Size Calculator indicator. You set Entry, SL, and TP via that indicator. I have answered that question in my previous reply. Then I don’t understand your reply. My second question is about PositionSizingCalculater, not Script. On “UseFixedSLDistance” mode and Buy, it works fine. Entry price (Buy @) will be placed at the high of the current candle. However, when we switch to Sell, SL and TP will be changed as it should. But the Entry price (Sell @) should be shifted to the low of the current candle, but it still remains on the current candle high. Any solution to this? I think it would be very easy for you to fix it. However, if you answered this as well, then I am sorry that I don’t understand you. please elaborate. Why do you believe that Position Size Calculator should switch the Entry price either to candle’s High or Low? The entry price is given by the user. The only time it is set by the indicator is the indicator’s initial attachment because it has to set it somewhere. Switching the Instant order’s type from Buy to Sell should only switch the Entry price from Ask to Bid. EDIT: If you want to discuss the issues related to the Position Size Calculator indicator, it is better to do so in the dedicated forum thread. This tool is good but I have two issues that need support on. First, It places “Buy/Sell Limit” order which is not correct in most of the cases. I want to only place a “Buy/Sell Stop” order. How can I do so?!! Second, as I saw that pointed out by another user, it should definitely shift the entry to low of the current candle in short positions. This is very very important. This script and indicator have made my life so much easier, thanks a million. Have a quick question, it’s not really an enhancement request, I just thought i’d ask here first in case I go down a wrong path. Do you know if it would be possible for me to edit this script so that when I place a pending order through the script, this pending order will be cancelled if the Stop Loss level is hit before the Entry Level? No. For that, you would need some kind of expert advisor that would be kept attached to the chart and monitor/cancel the orders. Hello, on the videos it looks like there is an option for ordering directly from the interface with the “buy@” button above the “Entry:” area. is that only for mt5, or is that available for the mt4 version too? The “Buy @” button switches from Buy order to Sell order when SL and TP are given in pips values and there is no way to move the lines around. It does not open a trade. You can set UseFixedSLDistance to true and the button will appear in both MT4 and MT5.